The New Year's update has come to minigore which brings more playable characters to hold us over until the multiplayer update. New playable characters are included with relatively low kill counts to unlock. You can now play as Lizzy or Ninja Man from Sway as well as the Zombieville USA guy. Plus kidgore has been enhanced, and isn't an in-app purchase. The game is all about John Gore, and now there is Gangster Gore with a much more sinister side. All of the characters don't change the gameplay, but they change the feel of the game, by infusing new life when playing with others. A really nice addition is that each have their own degrading health stage, and raging bull designs. Also included is the ability to wield dull shotguns of grenade launchers for massive damage. A great update making this game even more of an absolute must for only $1.99. Check it's ranking in the best shooter games appguide. Minigore went through Apple approval hell, but now is starting to get the huge planned updates out. 1.1 brought a much needed save system to pick-up right where you left off. Also great was a third health state (bandana) so now there are three health levels to go through. Furry sense was added so you can see the new incoming furries, and new faster flaming furries in all three sizes. Plus insane mode so you can start new games at 2000 or 6000 if you reach those plateaus. 1.2 was just released which brought even more furry blasting goodness. The first addition brings new playable characters that are unlocked when you reach a certain number of kills. Now you can play as Jerry Gore (old-timer), Evan Hsu (contest winner), Sensei Evan, Christmas John Gore (decked out in Santa outfit), and Enviro-Bear (from Enviro-Bear 2010). Those characters are unlcokable in-game, also Kid Gore and Santa are included as in-app purchases for $0.99 each. A new day night cycle is introduced with the inclusion of a boss: wormwolf. At each 1000 point interval, after 2000, it switches to night, and wormwolf appears (pictured up top), and as you progress he gets faster, tougher, and there are multiple ones. Also the grenade launcher is included to go with the shotgun as upgradeable weapons. There even is a christmas themed snow level for the christmas themed characters. More open feint achievements are included so the game doesn't only rely on high scores alone. 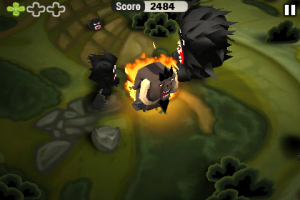 The combination of both updates moves Minigore to an absolute must as it's only $0.99, and you get so much. Just the save system, and a third health level really made this game, now everything else is gravy. The new unlockable playable characters and the boss make this more than the simple game it started as. 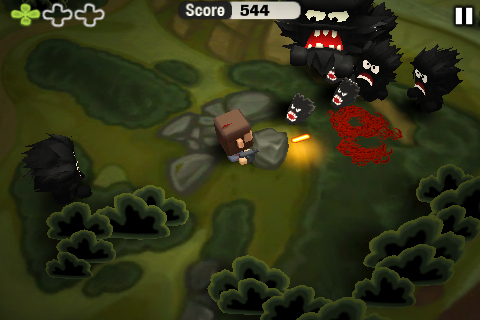 Minigore is an Absoulte Must in every way, and one of the very best games in the App Store, all for only $0.99. Minigore is at the most basic level a survival shooter. 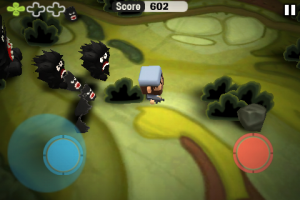 You play as John Gore in a land where black furballs with sharp teeth, furries, are continuously coming to kill you. Your goal is to keep John Gore alive for as long as you possibly can. 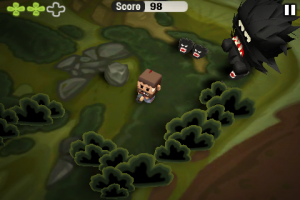 The game has 3D elements like bushes trees, and rocks with a 2D landscape. Also in 3D is John Gore, who has a cube head, and the furries that are in three cube sizes. Mountain Sheep has a lot of content to add to Minigore in numerous updates. Quite a few features come on launch, but the biggest draw of Minigore is what lies down the road. The control method is as easy as can be, using two virtual sticks, like idracula, one for movement and one for firing. 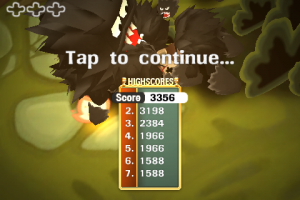 Minigore is extremely high score based, and includes Open Feint 2.0 to track online high scores. Another feature is expert mode which starts with tons of furries rather than building slowly. Also you can turn off the on screen control sticks. There are four different kinds of furries to deal with. There is the minifurry, furry, giant furry, and firefurry that is a super fast minifurry. Also the furry and giant furry split into smaller furries when they’re killed. To blast away the furries you have a machine gun with unlimited ammo that doesn’t require reloading, a shotgun you get by picking up a crate, and a bomb option by choosing to shoot the crate rather than picking it up. Another way to kill furries is to pick up three four leaved clovers which turns you into a minotaur like beast. As the beast you can simply run over the furries. John Gore doesn’t have a traditional health meter, but rather your health is indicated by his physical condition in two levels. This means that he begins with a cap, but then when one furry gets him, he's battered, and then if he gets hit again he’s dead. **According to Timo Vihola of Mountain Sheep, Minigore has tons of content that will be added in updates, similar to Pocket God. You can see a full screen version of all of the upcoming features in the gallery at the bottom of the review. The best aspect of the updates is that you can vote on them on the minigore website. The first update will include radar, three health levels rather than two, and a new version of Open Feint. The second update will add co-op with three charcaters to play as: John Gore’s 9 year old daughter, Enviro-bear, and the tagline contest winner, Evan Hsu. Also in the 2nd update there will be achievements, and the inclusion of in-game voting. After the first two updates, a whole bunch more will be included that will be determined by players’ votes. 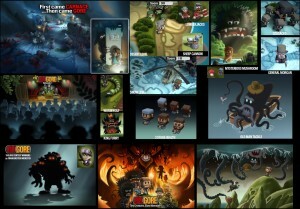 Some of the things that will be included are: More co-op characters from popular games, two new levels: snow and desert, four times as many hilarious lines for John Gore, new furries, new enemy groups: Lumberjacks & Cossacks, new weapon called sheep cannon, and new bosses: wormwolf, king furry, unibrow jones, old man tackle, and master of puppets. After that Mountain Sheep is considering campaign missions and expanding multiplayer, but ultimately it’s up to the voting. One thing is for sure, Mountain Sheep is in for the long haul, and Minigore will have a ton of content added. There is a whole bunch coming to Minigore, but how does it stand now? There is a bunch to like starting with the amazing visuals. The landscape looks like it's straight out of a storybook, and contains 3D objects. The design of the furries and John Gore are absolutely stunning, and John Gore's physical degradation is great. The animations work perfectly from the ever growing number of furries running at you on screen to the orange glowing rounds from your machine gun. When you kill a furry it’s the same stock mini blood spurt. When you become the beast he's flaming, and it's hilarious to see him still carrying the machine gun. The sounds are top notch as well with minigore’s original soundtrack that fits the adventure and impending doom theme, and varies enough so it doesn't feel repetitive. The gun firing, and growl of the furries sound great, and when you become the beast a heavy duty banjo tune is played. Maybe the best aspect is the included sayings of John Gore, voiced by Arin the Egoraptor Hanson. Sayings include: “I’ve killed like 100 already, how many more could there be?” and “That thing is as big as a bear... no bigger.” There is only survival mode, but it’s outstanding. The difficulty and fun amps up perfectly with more and bigger furries coming in at all times. The most fun, and most difficult aspect is the bigger ones becoming smaller ones as you shoot them. The controls get out of the way to enjoy running for your life, and blasting away furries. There’s just something about it that makes it so addictive to jump right back in, and blast some more furries. There’s only survival mode, so the gameplay is the same every time. Another problem is that the game does not save your progress. So if you’re in the middle of a survival at a score of 2500, and you exit for any reason, you can’t continue, you have to start all over. Finally it will be tough to wait for all of these awesome features.